The US is making efforts to create an independent Kurdish entity in northern Syria, Turkish political observer Mehmet Ali Guller told Sputnik, explaining how the US plan can be prevented, and how it is definitely not in the interest of the Kurds to become America's ground forces in the region. 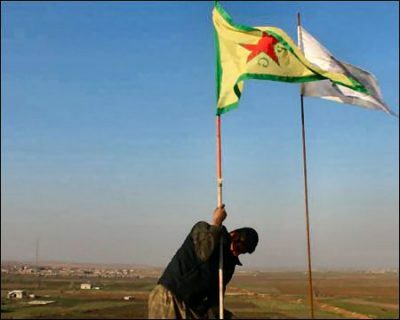 Washington is implementing its step-by-step plan to create a Kurdish independent state in northern Syria, Turkish journalist and political observer Mehmet Ali Guller believes. The US-led coalition has recently reported that 850 local volunteers are being trained to ensure the safety of the Syrian city of Raqqa. The announcement immediately prompted speculation that the designated security forces include the Kurdish-dominated Syrian Democratic Forces (SDF) militants. This information added to Ankara’s growing concerns about the US’ supposed intentions to establish an autonomous Kurdish entity in the north of Syria. According to Guller, the recent developments fit into Washington’s general strategy of creating the “Syrian Kurdistan.” He drew historic parallels between the war in Syria and the US occupation of Iraq, emphasizing the fact that the Pentagon has always relied on the Kurds. “The basis of the fight against Daesh [ISIS/ISIL], which was dubbed as the ‘Obama strategy’ in the US, was to place the Kurdish Democratic Union Party (PYD) and the People’s Protection Units (YPG) in the territories liberated from terrorists,” Guller explained in his interview with Sputnik Turkey. “Thus, the United States planned to unify the three cantons claimed by the PYD and expand the territory further downwards, and also to ensure the legitimacy of the Kurdish state in the course of the fight against Daesh,” he assumed. Guller believes that Washington is determined to stay the course. The Turkish political observer remains skeptical over the Trump administration’s decision to stop funding the CIA covert program aimed at arming and training the so-called “moderate” Syrian rebels. “The statement made by the CIA last week about the completion of the program to train and equip the Syrian opposition inspired some hopes for positive changes in the Syrian conflict. However, one should not be mistaken, the US hasn’t actually halted this program, it has just stopped supporting some jihadist groups,” Guller pointed out. “In fact, this major process of training [of US proxies] is being conducted right now. How? By training and providing military assistance to Kurdish self-defense units whom the United States continues to deliver wagons of weapons, most notably, heavy weapons,” the Turkish journalist highlighted. According to Guller, the Pentagon is trying to transform the YPG into a regular army. “If this happens, the YPG will be able to boost their positions in northern Syria and assert their dominance there,” he believes. However, the Turkish analyst suggested that the only way to impede Washington’s plan is to facilitate cooperation between Ankara and Damascus. The Turkish leadership needs to realize that Ankara and Damascus’ interests in the region overlap, Guller insists. “The situation could be stabilized only through a gradual, step-by-step process which will take place if Ankara and Damascus reach an agreement on it. Otherwise, the US will create Kurdistan in Syria as they have done in Iraq over 25 years,” Guller warned. On the other hand, it’s not in the interest of the Kurds to be turned into US ground forces in the region, he added. “The only way to exist in peace and stability for neighboring nations is to bring an end to the American imperialism in the region,” the Turkish political observer told Sputnik. The Saker, a US-based military analyst who runs his own blog of the same name, shares Guller’s concerns about the alleged US plans to create an independent entity in northern Syria. “It has always been US policy to support minorities against majorities,” the military analyst added. However, according to the blogger, the US plan is likely to fail. “I am convinced that the USA will eventually try to break up Syria. That is typical US strategy: what they cannot control they will try to break… The good news is that Russia is opposed to that plan and that Iran and Turkey are also opposed to it as a direct consequence of their opposition to the creation of any type of Kurdistan,” the military analyst elaborated. “This reality on the ground means that any US plan to create some type of Kurdistan to weaken Syria and put pressure on Turkey and Iran will end up being a pipe dream,” he said.